E-HELP FORM(seen all over site) and directly below for your convienience. No call is to be connected to our very busy trained winning e-network with implementing help form, thank you." Child then begins to deteriorate while a state employee cites, under oath the child is doing just fine judge." Georgia DCFS remove a child then failed to return,reunite, while lieing under oath. Texas child was removed by a DFPS while loving parents are force to separate. Child suffering under state supervision. DCFS caseworker fails to advise the judge,deliberately fails to advise mom. Child missing his family and want to go home. The child has clearly inform the worker,"i want to go home. "I miss my family. Caseworker under penalty of perjury lies to the judge by citing, "Oh the child is doing well with his FOSTER parents judge. "He do not want to go home. The child want to remain with the stranger. The foster family. They are more "fit"to raise the child, judge. 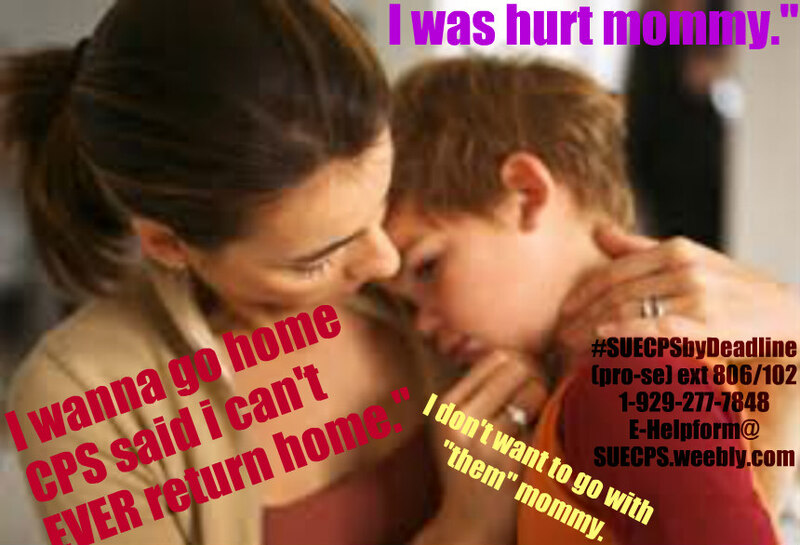 CPS social worker, caseworker has been told by the child she is at risk and she need to be protected, by going home to not be hurt anymore." The social worker deliberately lie to the judge to see to it the child remain in the same DANGEROUS foster home. Child missing his family and want to go home. DCPS lie and inform the judge at the next" Compliance Review/court hearing" the child said she want to remain where she is and doesn't ever want to go home." Good luck while suing cps pro-se, (the right way) and timely." Fill out our E-HELP FORM and be sure to encompass CORRECT information or your 1-on-1 POWER session on suing DCFS shall not commence." Then,call 20 min,(after filling out and verifying your email has been received) check your email account to ensure you were responded to and good luck suing timely, DCFS,DFPS,CHFS,ACS,CYS,DHS,DHS."